New Peterborough Panthers number one Craig Cook completed the first part of his bid to become British champion yesterday (May 15). Cook eased through a semi-final at Glasgow with 10 points to book his place in the national final next month. 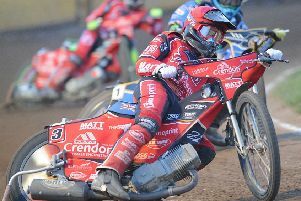 The Cumbrian-based racer will be among the favourites to be crowned British champion after finishing in second spot – behind world champion Tai Woffinden, who is not taking part this year - in the last two seasons. He will also benefit from having home advantage with the British Final being staged at the new National Speedway Stadium in Manchester (the home of his Elite League side, Belle Vue) on Monday, June 13. Fellow Panthers rider Simon Lambert missed out on qualification in his semi-final at Scunthorpe last Friday. Lambert managed five points from five rides at the Eddie Wright Raceway. But there was success for Panthers skipper Ulrich Ostergaard on the same night as he booked his place in the Danish Final. Ostergaard scored eight points from his five rides to take eighth position in a semi-final at Glumso. The final at Holsted on Friday, June 3.